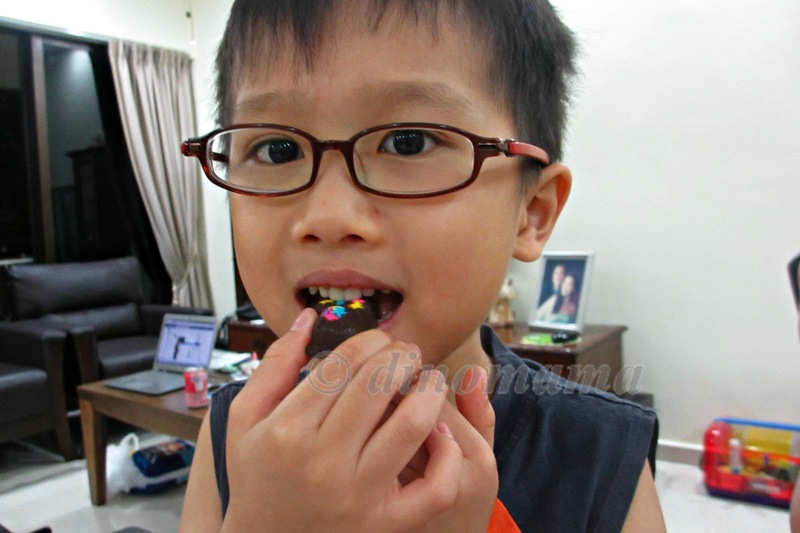 Christmas is just round the corner I thought I'll share a simple & easy chocolate candy for today's Foodie Fridays post. Now, how did chocolate come to have any connection to Christmas? Well, we have to give credits to Queen Victoria who gives them as a gift to soldiers in the Boer War as Christmas/New Year's gift in the 1900s. Yeah, who hates chocolate? Even if you are not a fan you would love to taste it now and then just coz... its chocolate and it's suppose to make you feel good after eating it. 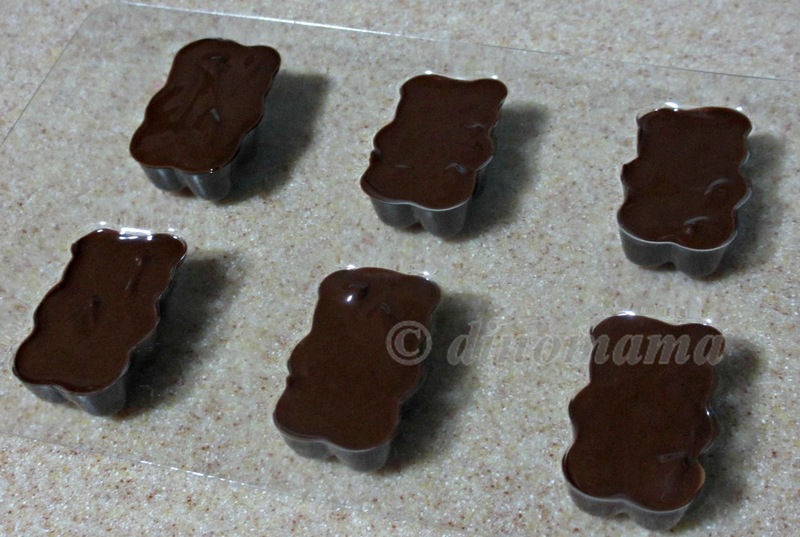 So I tried my hands in making some chocolates. Being ambitious and every thing, I initially wanted to do chocolate pops with different colors on it, however given the shortage of time plus the body is screaming for rest, I decided that plain chocolate will do. Then again, I think I'm doing injustice to the chocolate so I added some sprinklers I found in my fridge to make it more cheerful. I got the packet of chocolates, how to melt them? I googled and there are 2 ways, #1 microwave oven #2 double boiler. The laziness in me decided to use the microwave, how difficult can it be to simply just press a few buttons on n off many times? Very difficult!!! Especially when when your microwave oven is in a built-in shelf higher then you and you have to tip your toes just to peep in the bowl or its at 1300 walt heat (min) *smack thyself*, that's for trying to be a smart alec and not checking with DinoPapa. 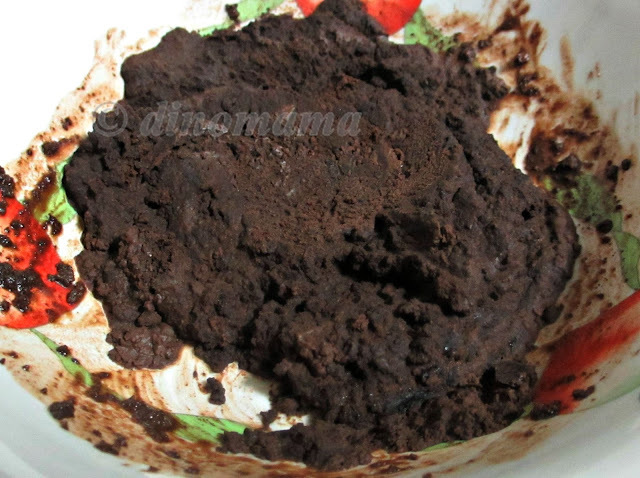 The result - a very burnt chocolate like the one below (the chocolate had solidified) and into the bin it goes. Out came my pan, fill it with water and fire turned on. 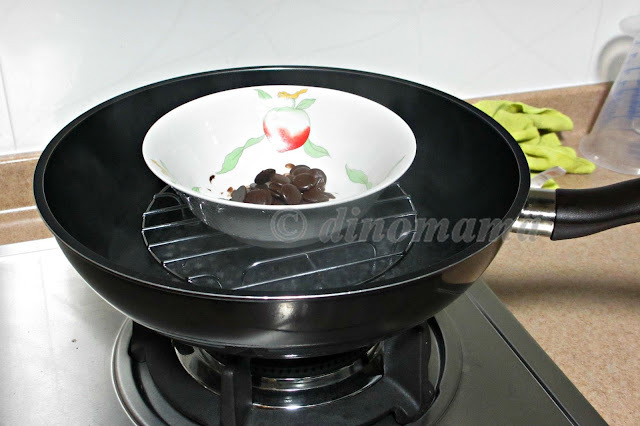 Once water is boil I put the bowl with a new batch of chocolates into it. Photo 3. About 5mins later, its in liquid form. Stir continuously until it is shiny, smooth, and completely melted. 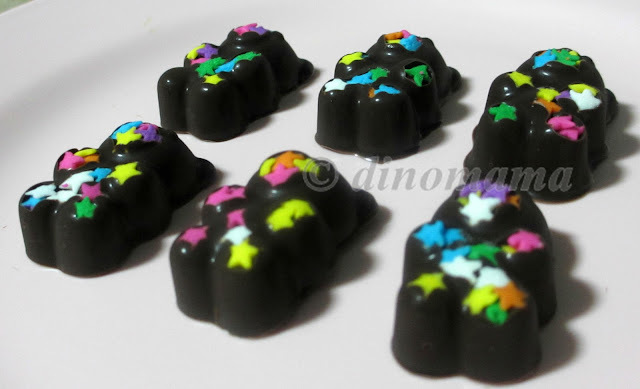 I put some colorful sprinklers into the mould before spooning the chocolates in. After I'm done, I throw them into the freezer. 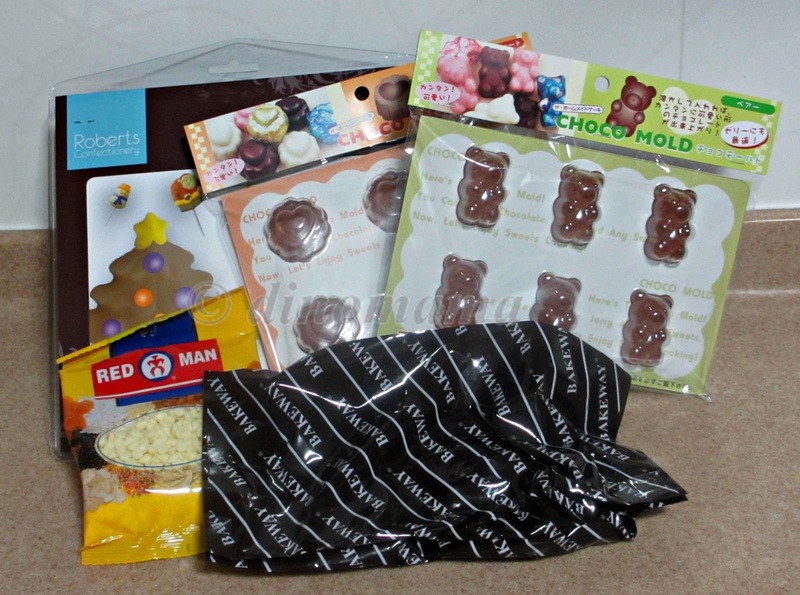 10 mins later the chocolate are set and harden, ready to be eaten! We do not celebrate Christmas or hold New Year party in our family but I love the food being served. Thus I decided to host the Festive Fare blogtrain, gather a few mummies to share their favourite or must-have dish in a Christmas or New Year party. Perhaps it will get me going and start planning my own Christmas or New Year parties starting next year! The Festive Fare will go live on 10th December 2012, starting with me and my gingerbread man cookie, follow by 1 mummy each day to share their food. 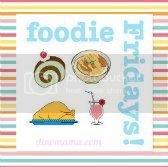 Do stay tuned to see the yummylicious food and if you have a dish you would like to share with us, remember to link up when the blogtrain is on the road. Ooh! I like your idea of putting the sprinkles for colour! Clever! Mardder Liza, decided to use otherwise put in my fridge n it "rots". DinoPapa banned iscream some time back so no chance to put that with the sprinklers. Looking forward to the festive fare train! Already spotted some recipes which sounds really yummy! Serene, I'm looking forward to your recipes!